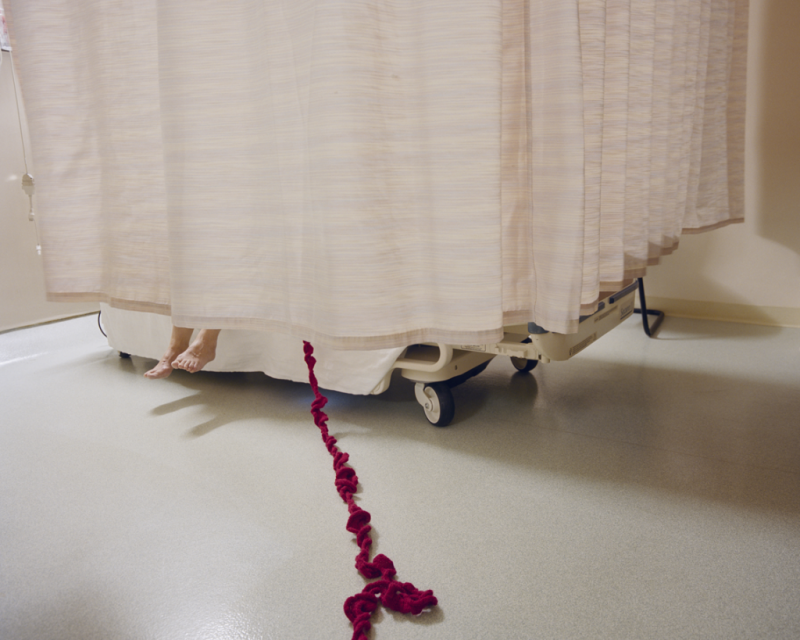 Monotony, repetition, and duration of my craft explore the longevity of illness and the feeling of sameness associated with being in the hospital. While enclosed in a hospital room, life continues on in the outside world and in a sense, passes the patient by. Time becomes an element that exists in a slow motion within the hospital and is hurrying by beyond its doors. Jennifer Wilkey is an interdisciplinary artist working in a variety of mediums to discuss the experience of illness. Originally from the Midwest, she graduated from Syracuse University in 2009 with a MFA in Photography. She currently lives in Maine where she teaches at the University of Southern Maine and works for ArtVan, a mobile arts therapy program. Her artwork has shown frequently in exhibitions and screenings in the US and abroad, including recent exhibits at the Center for Photography in Woodstock, New York and the Soho Photo Gallery in NYC. In 2010, she was awarded a Professional Scholarship Grant from the Lucie Foundation in Los Angeles to fund a photography project about her developmentally disabled brother. Selected by Anne Lyden, International Photography Curator at the National Galleries of Scotland.